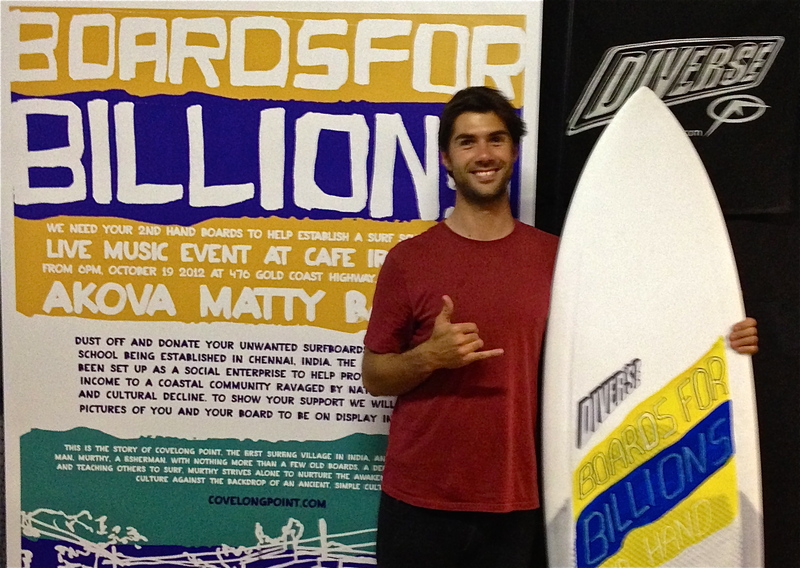 The Boards For Billions event sought to raise funds and equipment to assist the small coastal community of Covelong, India to start their very first Surf School. The event, held at Tugun’s Café Ira, was an amazing success with over 36 boards collected and over $500 raised. “I can’t believe the success of this event, the community has rallied together and done something amazing,” said key organizer-Mr Salvador Cantellano-in reference to the night’s activities. The night, which featured music from local artists Mattie Barker and Akova received sponsorship from Café Ira, Diverse Surf, the Centre for Tourism, Leisure and Work, Southern Cross University, Digital Cinematix, the Music Hub, Relative Creative, Rabbit and Cocoon, OBFive Skateboards, Dusc Apparel, Quicksilver, Element, Dune and Potato Press. The Boards for Billions project started at a chance meeting in the Currumbin Valley Farm Campus at Christmas time in 2011 involving Yotam Agam of EarthSync India and Salvador Cantellano of Digital Cinematix. The two met at the Ethno Australia Festival. Yotam, a music producer by day, had been making regular migrations to the Covelong community for several years, where he met Murthy. Murthy had taught himself to surf by picking up old, scrappy boards that people (mostly foreigners) had left on the beach. Over time and friendship formed between the two unlikely characters, and Murthy asked Yotam to assist him in setting up a social enterprise surf school in the Covelong community to provide a source of income for a people marred by poverty. Yotam happily obliged. When Yotam met Salvador Cantellano, Gold Coast film producer and cultural worker, the two clicked and the rest, as they say, is history. The Covelong organizers would like to thank everyone who donated equipment and boards. If you would still like to donate to this cause please email ethnoaustralia@gmail.com.